To make crust, combine the flour and salt into a bowl and cut in butter with your fingers (or use a food processor) Once butter are broken down to the size of peas, add maple syrup and 1 tablespoon of water at a time to the mix, stir/kneading until the dough comes together, working dough as little as possible. Dump dough onto a flour covered surface and divide into two pieces. Form pieces into disc, wrap in plastic, and place in refrigerator for 20 minutes to chill. Roll one piece of dough into a large circle, enough to cover a 9″ pie pan with crust hanging over. Pour filling into the pie pan. 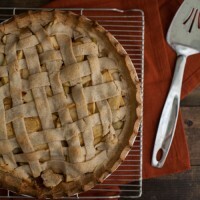 Roll out the second pie crust and cut into strips (if wanting) or place the crust on top whole. Crimp the edges and cut slits in the top if using the crust whole. Brush crust with melted butter. Bake for 45-55 minutes or until the top has browned and the apple filling in bubbling out the sides. Let cool before serving to all the pie to set slightly. *If while baking the crust edges start to brown too much, try cover with a bit of parchment paper or foil. If the pie doesn’t bake long enough, the filling might still be a bit juicy!